If there were such thing as a Dictionary of Stereotypical Characters, the entry for “eccentric inventor” would have a picture of Fred Waller. In the 1920s and ’30s, Waller’s day job was at Paramount’s East Coast studios in Astoria, Long Island, where he worked as a photographic jack of all trades. In one capacity or another he worked on, among other pictures, Male and Female (1921) for Cecil B. DeMille, and That Royle Girl (’25) and The Sorrows of Satan (’26) for D. W. Griffith. In the ’30s he produced and directed a series of innovative and visually striking jazz-flavored shorts featuring the likes of Cab Calloway, Duke Ellington and Fats Waller. Meanwhile, on his own time, he tinkered and puttered. He invented a container for keeping food dry in humid climates, a remote-recording wind direction-and-velocity indicator, an adjustable sail batten for sailboats, and a still camera that could take a 360-degree panoramic picture. (Also, as I mentioned before, water skis, which he marketed as Dolphin Awkwa-Skees.) Through it all he continued his obsession with finding a way to photograph the full range of human vision, pursuing his idea that peripheral vision was as important to depth perception as binocular vision. He used to walk around his home wearing a baseball cap with toothpicks stuck in the brim, testing how far back he could place the toothpicks and still see them, mulling over the kind of screen he would need for what he had in mind. In 1938, architect Ralph Walker came to Waller with a unique photography challenge connected with an exhibit Walker was designing for the petroleum industry for the upcoming New York World’s Fair. Walker envisioned a spherical room with a battery of projectors casting a constant stream of moving pictures, an idea that dovetailed neatly with what Waller had been turning over in his own head. With Walker’s firm, Waller formed the Vitarama Corporation, and by early 1939 he had a working model of eleven 16mm projectors showing a patchwork image on a concave quarter-dome screen suspended over the heads of the audience. In the end Walker’s clients, the representatives of the petroleum industry, decided not to use Waller’s Vitarama, opting for something simpler, more conventional — and, not incidentally, cheaper to produce and exhibit. Waller adapted the Vitarama idea for another exhibit at the 1939 World’s Fair, a huge mosaic slide show of still images for the Eastman Kodak exhibit. More important, the idea of the concave screen had solved Waller’s dilemma over how to project his multi-part images to envelop an audience. Waller and Walker obtained the backing of Laurance Rockefeller, scion of one of the world’s wealthiest families, to continue developing the Vitarama process, and an experimental lab was set up in the old Rockefeller carriage stables in Manhattan, where a number of invited guests saw demonstrations of the cumbersome process. 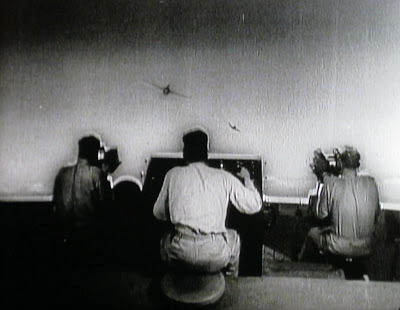 The outbreak of World War II in Europe effectively back-burnered any plans to exhibit Vitarama theatrically, but one of those invited guests, a friend of Waller’s, was an admiral in the U.S. Navy specializing in ballistics, and he approached Waller with the idea of using Vitarama in training aerial gunners — looking forward to the time (which virtually everyone knew was coming) when the U.S. would be drawn into the war. With a massive influx of military money (Waller later estimated it at over $5 million), the Waller Flexible Gunnery Trainer was born. It simplified the Vitarama design, using five 35mm projectors to display the same size image as the eleven 16mm ones, and it enabled Waller to work out the technical challenges involved in both the process itself and the manufacture of the equipment. Eventually 75 trainers, each occupying an area of some 27,000 cubic feet, were set up all over the U.S., in Hawaii, and in England, where over a million men were trained; the Air Force estimated that more than 250,000 casualties were averted thanks to this training. After the war Waller returned to developing Vitarama for theatrical use. The Cinerama Corporation (it’s not clear exactly where the idea for the name came from) was formed in 1947, with the backing of Laurance Rockefeller, publisher Henry Luce of Time Inc., and other venture capitalists who were prominent in East Coast circles. Also coming aboard at this time was Hazard E. “Buz” Reeves, one of the most brilliant and inventive men in the history of sound recording. 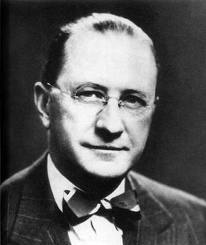 Reeves had seen Vitarama as early as 1940, and was excited at the prospect of developing a sound system to go with it. 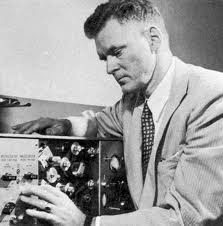 Reeves and his company, Reeves Soundcraft, pioneered the use of magnetic recording for movies, a method more versatile than the standard practice of optical sound recording. As Waller simplified the Vitarama/Cinerama process from five projectors to three, and from the quarter-dome screen to a wide curved rectangle (like the inner surface of a slightly flattened cylinder), Reeves developed a sound system to match: five huge loudspeakers behind the screen, each with its own discrete track, and a sixth track dispersed as needed to speakers placed at the rear and sides of the auditorium. (A seventh track, a composite of the other six, was intended only as an emergency backup and seldom used in practice.) Naturally, seven separate magnetic soundtracks required far more space than a standard optical soundtrack, so the sound was recorded on its own strip of 35mm film and run on a separate “projector” synchronized with the three image projectors just as they were synchronized with one another. Standard 35mm sound film runs at a rate of 24 frames per second, 90 feet per minute. Cinerama ran at 26 frames per second, with each frame half-again as high, which worked out to 146.3 feet per minute. The soundtrack(s) ran at the same speed, or 29.25 inches per second, nearly twice the rate of broadcast-quality tape machines of the day. This allowed Reeves’s microphones to record a far wider dynamic range, 30 to 15,000 cycles per second (cps), as compared to the standard 125 to 7,000 cps of the day. Reeves and Waller could thus record and reproduce sound with a range and fidelity that, while commonplace enough to us in this digital age, were simply astounding to ears of the late 1940s. Also in 1947, Waller moved his base of operations to an unused indoor tennis court on an estate in Oyster Bay, Long Island, where he and Reeves set up an experimental lab and the first Cinerama screening room. By the spring of 1949, they had the entire process — camera, projectors, screen, sound system, and demonstration reels — ready to show to further prospective investors. Through the rest of the year, they invited a parade of movie industry figures — theater executives, studio heads, producers, writers, technicians — out to Oyster Bay to see what they had. The results and reactions were gratifying — up to a point. As Buz Reeves later remembered, there was “a terrifying inertia to their enthusiasm”. It was too cumbersome, too expensive, too complicated, too impractical, yadda yadda yadda. Everybody thanked Waller and Reeves for the show, but passed on the idea of doing anything with it (or about it) themselves. In May 1950 a demonstration screening for the press attracted little attention and less publicity. Laurance Rockefeller and Henry Luce decided Cinerama was going nowhere, so they withdrew, selling their interest in the process to Reeves for a paltry $1,500. The Cinerama Corporation was dissolved (though Vitarama Corp. continued to hold all the relevant patents). But Waller and Reeves didn’t lose heart; Reeves was literally putting his money where his microphones were. And indeed, all was not lost; Cinerama’s twin angels were just around the corner. I never knew any of this. Fascinating stuff. Looking forward to part two. You can see all this come alive in a feature documentary that will air on Turner Classic Movies on Oct 18th. Its called Cinerama Adventure! It's true, Anon, Dave Strohmaier's Cinerama Adventure is a terrific documentary, and highly recommended. It's also included in the Blu-ray and deluxe DVD editions of How the West Was Won.